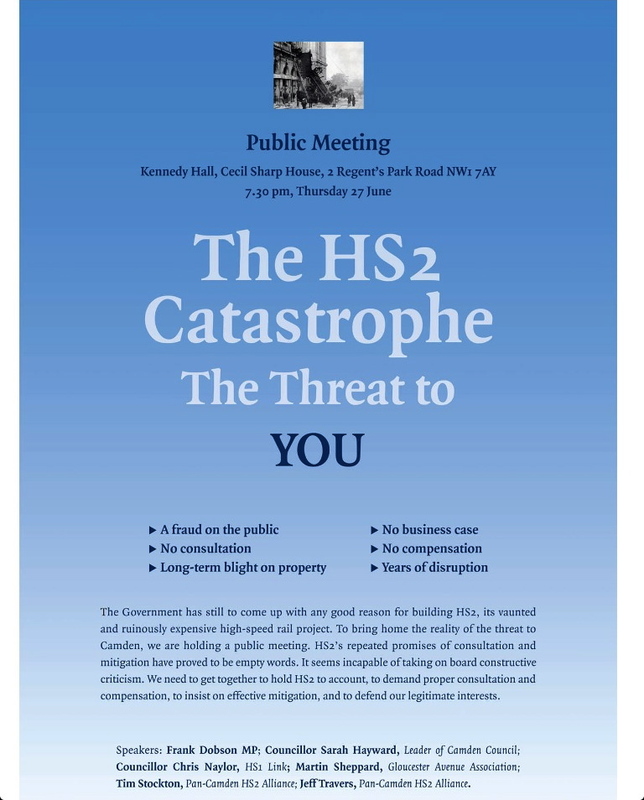 It would be pretty safe to say that last night’s meeting, at Cecil Sharp House, Primrose Hill, was antipathetic to the HS2 cause. The motion at the end of the evening proved it. Astonishingly, out of around two hundred people, one brave soul was prepared to put up his hand in favour of HS2, to the great surprise of Chairman and local historian Martin Sheppard, who summarised the voting as ‘one against the world’. So what had incited this upswell of passionate activism? HS2 is the proposed high-speed train line to link London with Birmingham. Despite costs running into tens of billions, and in the face of doubt over whether the scheme is necessary, the government is still showing every sign of intending to press ahead. And locally, according to last night’s speakers, that is a very bad thing. Speakers, including Frank Dobson MP and Councillor Sarah Haywood, leader of Camden Council, painted a bleak picture. In order to reach Birmingham by train approximately twenty minutes more quickly, thousands will be turfed out of their homes, and a swathe will be cut through Camden Town, blighting dwellings and businesses, including the much-loved market. Natalie Bennett, Leader of the Green Party, drummed home the excesses of costs involved, and explained the specious nature of the so-called green arguments rehearsed in favour of HS2: she was clear that HS2 will bring more people into our already overcrowded capital city, that it will encourage London-centric activity, and will not increase use of internal flights. Last night’s panel of experts were clear that there will be no benefit to our borough if HS2 goes ahead, while the costs – in terms of money, of course, but also in terms of human experience – will be immense.